This cranberry sauce is full of flavor and everyone I serve this too wants to know whats in it. I love coffee and can drink it all day everyday and I came up with the idea of boiling pears in a mixture of strong vanilla flavored coffee before adding them into the cranberry sauce. Now you can have your coffee and your cranberry sauce! Coffee is probably not a flavor that you expect to find in a cranberry sauce, but this cranberry sauce is Disneyland for your taste buds! 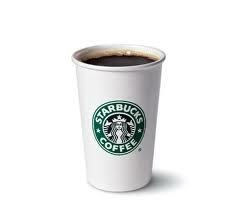 When you combine all of the ingredients together, the flavor is delicious and the coffee just adds another dimension. This will not taste like coffee cranberry sauce, but it will have a unique flavor that makes you keep wanting more. This is so good, that I have seen people put this on their plate and eat it for dessert. 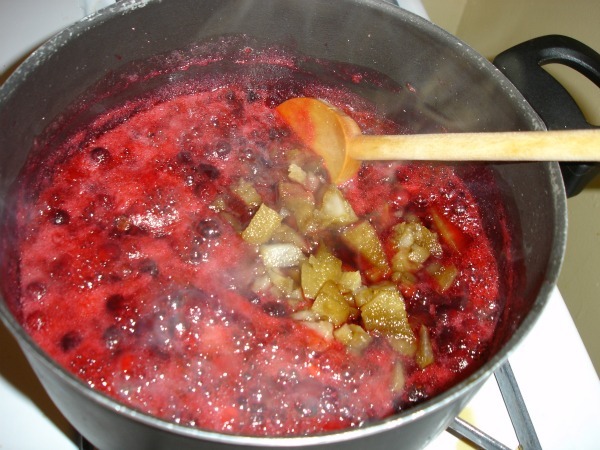 Add those sweet succulent pears into the cranberries. Once you put this in your mouth, you will never want to open a can of cranberry sauce ever again. Look at those juicy pears swimming in a sea of sweet sticky goodness...plump cranberries, sugar, pears, vanilla coffee. Yes Please! Slice pears in half (to allow even more of the coffee flavor to infuse the pears, cut the pear into smaller chunks, or simply cut the halves in half:-). Brew six cups of coffee and stir in 1 1/2 cup of sugar and the vanilla. Put coffee mixture into a pot and let it come to a boil, add pears and bring back to a boil. Let the pears simmer for 15 minutes. Let the pears sit in the coffee mixture for ten minutes and then discard the coffee mixture. When the pears are completely cool, chop the pears into very small cubes and set aside. Stir the remaining white sugar and light brown sugar and water together in a pot and bring to a boil. 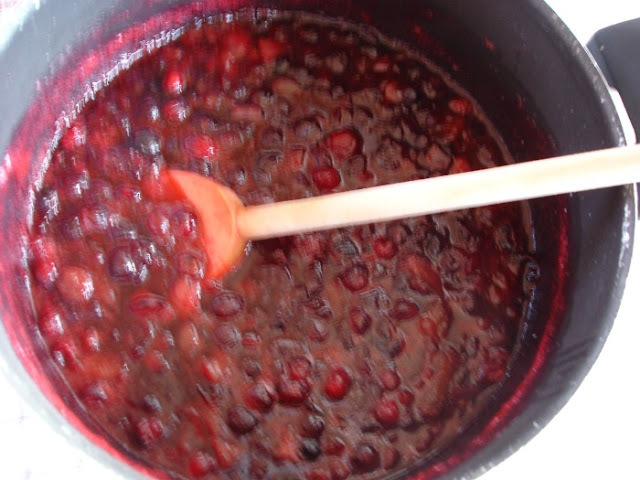 Add the cranberries and bring back to a rapid boil then simmer and boil gently on medium/low heat for ten minutes. 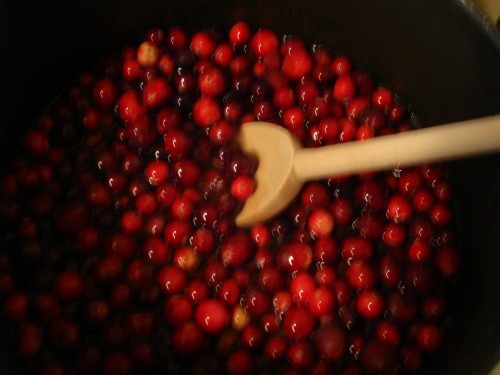 As the cranberries are cooking, use spoon to gently pop the cranberries. 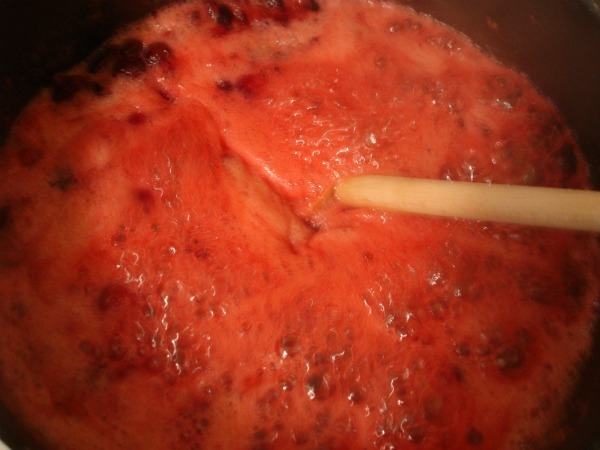 It is important to cook the cranberries long enough to release the natural pectin that makes the cranberries turn into a thick jelly consistency. 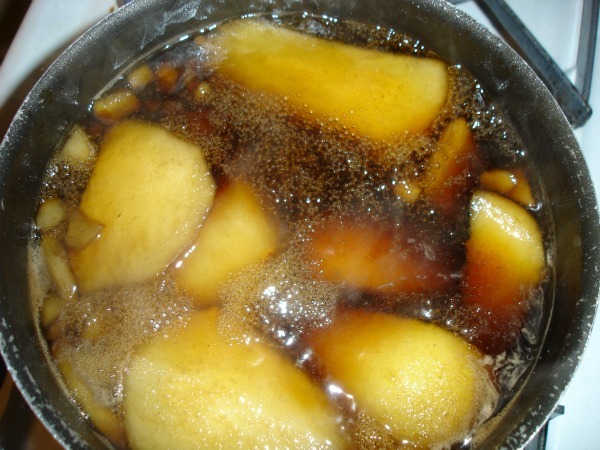 Add the pears to the mixture and cook for another few minutes to evaporate the extra moisture from the pears. Let it bubble away on low heat and you may need to let it cook for anywhere from another 3-7 minutes. Be careful to stir constantly to make sure the sauce does not burn. Let cool and refrigerate. The sauce will thicken as it cools. Note: After this has cooled and been refrigerated, you should have a nice jelly like consistency. If your sauce does not thicken, just simply put back in pot and cook a bit longer to evaporate some of the extra liquid. Another great receipe! And this one seems very easy to do!! Thanx alot for passing by my blog and for ur lovely comment. Hmmmm this looks so good. I definitely wanna try it out! I've never seen anything like this, but you did a fantastic sales job on it! I'm intrigued - looks delicious!! YUMMY YUMMY YUMMY!!! So delicious. This is a terrific twist on cranberry sauce! Never thought of boiling pears in Coffee like that, but it sounds delicious. Have to give this a serious try, thanks!